With simulated unsupervised learning, breaking captchas has never been easier. There is no need to label any captchas manually for convnet. By using a captcha synthesizer and a refiner trained with GAN, it's feasible to generate synthesized training pairs for classifying captchas. Correctly label 10000 out of 15000 captcha or 90% per character. Here we download some captchas from the contest website. Each batch has 1000 captchas. We'll use 20000 so 20 batches. Each challenge file is actually a json object containing 1000 base64 encoded jpg image file. So for each of these challenge files, we decompress each base64 strs into a jpeg and put that under a seprate folder. Instead of RGB, binarized image saves significant compute. Here we hardcode a threshold and iterate over each pixel to obtain a binary image. As you may have noticed, all the captchas share the same horizontal lines. Since this is a contest, it was a function of participant's username. In the real world, these noises can be filtered out using morphological transformation with OpenCV. We will extract and save the lines(noise) for later use. Here we average all 20000 captchas and set a threshold as above. Another method is using a bit mask (&=) to iteratively filter out surrounding black pixels i.e. The effectiveness of bit mask depends on how clean the binarized data is. With the averaging method, some error is allowed. Using a Keras built in generator function flow_from_directory to automatically import and preprocess real captchas from a folder. Now that we have processed all the real captchas, we need to define a generator that outputs (captcha, label) pairs where the captchas should look almost like the real ones. We filter out the outliers that contain overlapping characters. """keras generators may generate an incomplete batch for the last batch"""
Plug all the data in an MNIST-like classifier and call it a day. Unfortunately, it's not that simple. Obviously I am not going to label 4000 captchas and break my neck in the process. Meanwhile, there happened a burnt out guy who decided to label all 10000 captchas. This dilligent dude was 2000 in. I asked if he is willing to collaborate on a solution. It's almost like he didn't want to label captchas anymore. He agreed immediately. Using the same model, accuracy immediately shot up to 95% and we both qualified for HackMIT. The refiner network, Rθ, is a residual network (ResNet). It modifies the synthetic image on a pixel level, rather than holistically modifying the image content, preserving the global structure and annotations. 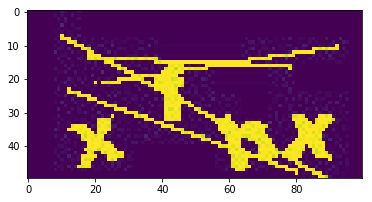 The discriminator network Dφ, is a simple ConvNet that contains 5 conv layers and 2 max-pooling layers. It's abinary classifier that outputs whether a captcha is synthesized or real. Pipe the refined image into discriminator. :param input_image_tensor: Input tensor that corresponds to a synthetic image. :return: Output tensor that corresponds to a refined synthetic image. each with `nb_features` feature maps. See Figure 6 in https://arxiv.org/pdf/1612.07828v1.pdf. :param input_features: Input tensor to ResNet block. 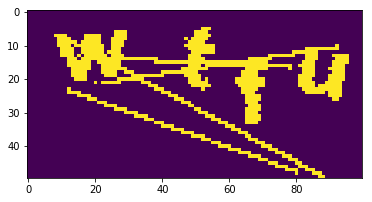 :return: Output tensor from ResNet block. :param input_image_tensor: Input tensor corresponding to an image, either real or refined. 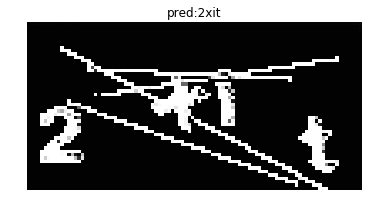 :return: Output tensor that corresponds to the probability of whether an image is real or refined. It is not necessary to pre-train GANs but it seems pretraining makes GANs converge faster. Here we pre-train both models. For the refiner, we train by supplying the identity. For the discriminator, we train with the correct real, synth labeled pairs. Saving batch of refined images during pre-training at step: 0. Refiner model self regularization loss: [ 0.05277019]. Saving batch of refined images during pre-training at step: 10. Refiner model self regularization loss: [ 4.2269813]. Saving batch of refined images during pre-training at step: 20. Refiner model self regularization loss: [ 0.76108101]. Saving batch of refined images during pre-training at step: 30. Refiner model self regularization loss: [ 0.28633648]. Saving batch of refined images during pre-training at step: 40. Refiner model self regularization loss: [ 0.19448772]. Saving batch of refined images during pre-training at step: 50. Refiner model self regularization loss: [ 0.16131182]. Saving batch of refined images during pre-training at step: 60. Refiner model self regularization loss: [ 0.11931724]. Saving batch of refined images during pre-training at step: 70. Refiner model self regularization loss: [ 0.11075923]. Saving batch of refined images during pre-training at step: 80. Refiner model self regularization loss: [ 0.10888441]. Saving batch of refined images during pre-training at step: 90. Refiner model self regularization loss: [ 0.10765313]. Discriminator model loss: [ 0.04783788]. This is the most important training step in which we refine a synthesized captcha, then pass it through the discriminator and backprop gradients. # TODO: what is an appropriate size for the image history buffer? Saving batch of refined images at adversarial step: 0. Refiner model loss: [ 2.46834831  0.01272553  2.45562277]. Discriminator model loss real: [  2.27849432e-07]. Discriminator model loss refined: [  1.63936726e-05]. Saving batch of refined images at adversarial step: 10. Refiner model loss: [ 27.00968537   0.11238954  26.8972959 ]. Discriminator model loss real: [  1.26835085e-10]. Discriminator model loss refined: [  4.44882481e-08]. Saving batch of refined images at adversarial step: 20. Refiner model loss: [ 26.89902883   0.10987803  26.78915081]. Discriminator model loss real: [  1.48619811e-07]. Discriminator model loss refined: [  4.60907181e-08]. Saving batch of refined images at adversarial step: 30. Refiner model loss: [ 25.93090506   0.10890296  25.82200208]. 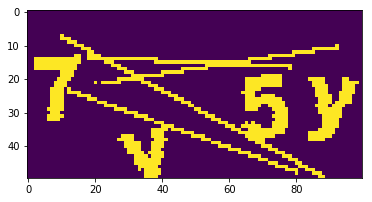 Discriminator model loss real: [  3.96611703e-09]. Discriminator model loss refined: [  5.07067440e-08]. Saving batch of refined images at adversarial step: 40. Refiner model loss: [ 28.67232819   2.33041485  26.34191332]. As you can see below, we no longer have the cookie-cutter fonts. There are quite a few artifacts that did not exist before refinement. The edges are blurred and noisy - which is impossible to simulate heuristically. 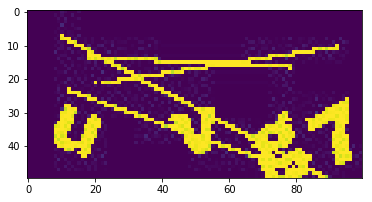 And it is exactly these tiny things that renders MNIST-like convnet useless. Now the refined results are basically the original captchas. 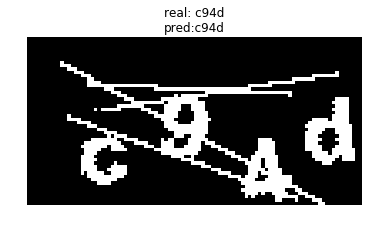 Now we finish the puzzle by building an MNIST like convnet to predict captcha labels.